NMC officials tour the Yellow River Conservancy Technical Institute campus in 2014NMC instructors will pioneer NMC courses in Chinese classrooms next week, the culmination of a partnership five years in the making. They’ll teach two Water Studies courses and two basic construction courses to about 40 students at the Yellow River Conservancy Technical Institute in Kaifeng, China. The two-week courses are the first in a sequence to be completed later this year. Scott Swan and Brian Sweeney will teach in English with interpreter support. 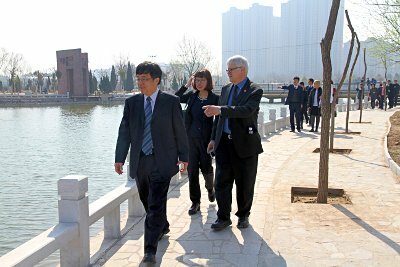 “We are delivering our courses there for the ability to augment their training with our coursework,” said Hans Van Sumeren, director of NMC’s Great Lakes Water Studies Institute, who’s traveled to China twice since 2015 as NMC has nurtured the partnership with the three-year technical school. Van Sumeren and Construction Technology director Dan Goodchild will round out the NMC contingent to plan delivery of the second part of the sequence, set for late fall or early winter. The June courses are Blueprint Reading, basic carpentry, Underwater Acoustics and Sonar and Great Lakes Research Technologies. 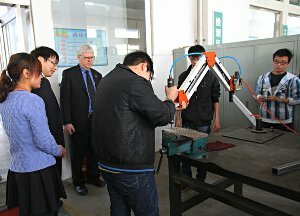 Besides connecting with a school with a growing enrollment – Yellow River’s surveying program enrolls about 1,800 students – Van Sumeren said the partnership could afford NMC students both a study abroad opportunity and a chance to apply their coursework in a completely different geographic environment. China’s large, fast-flowing rivers flood frequently and catastrophically, Van Sumeren said. The Yellow River alone has flooded 1,500 times in last 2,500 years, wiping out millions of people. NMC students could study what the Chinese have done to turn floodplains into protected cities. “Those are things we can’t show students in Grand Traverse Bay or other Great Lakes waters,” Van Sumeren said. Both instructors, who are making their first trip to China, said they’re looking forward to the teaching experience. “It’s an opportunity that not only can further the goals of the college, but for me to expand as an instructor, branch out beyond the comfort zone,” Swan said.